"The incident that happened last week is a terrible representation of who I am and what I stand for," Lauletta said. 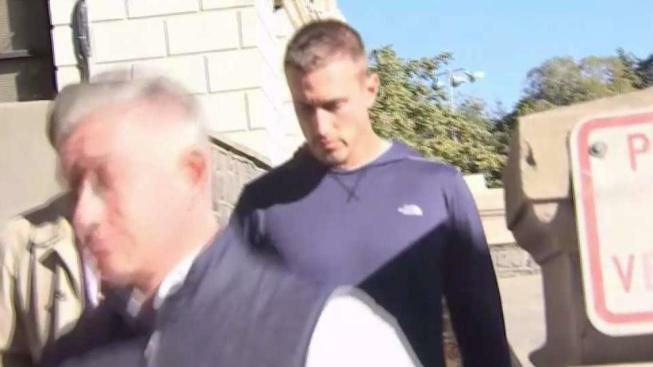 Giants rookie quarterback Kyle Lauletta apologized Tuesday morning, a week after he was arrested for motor vehicle violations near his home in Weehawken, New Jersey. "First things first, I want to apologize to the New York Giants organization, my teammates, the fans and my family," Lauletta said. "The incident that happened last week is a terrible representation of who I am and what I stand for. Right is right and wrong is wrong. My parents raised me better than that." According to Weehawken police accounts, Lauletta, the Giants' fourth-round pick from Richmond, was driving his 2017 Jaguar on Tuesday morning, Oct. 30, when he was stopped for failing to obey a police officer's order to continue driving straight. The report says Lauletta almost hit a police officer while making an illegal turn. He was stopped by a second police officer and refused to produce a driver's license or exit the car. Police say he was arrested and charged with eluding police, obstructing administration of law and resisting arrest. He was also charged with reckless driving, disregarding an officer's directions, improper turn and failure to remain in a marked lane. Police said Lauletta's car was involved in a similar incident Oct. 29, but summons were mailed because the vehicle did not stay at the scene. The Giants were on their bye week, so he did not have to report to any organized practices until Tuesday. After practice, Lauletta said he was apologetic about the incident. "I understand the cops have a very tough job and it was very chaotic at that location," Lauletta said. "I respect these officers and I can't say that I'm sorry enough. I have to prove myself worthy through my work ethic and put it all behind me. That's all I can control and I hope to move forward from this." Giants coach Pat Shurmur said that Lauletta will not face any suspension for his actions. "It's being handled internally," Shurmur said. "I'm very disappointed with the way it went down. I spoke to Kyle and this is not the way we want our players to act. The whole incident is disappointing. He's back to work today and we'll deal with it." Shurmur said that Lauletta's problems with the police stemmed from him being late for meetings prior to practices both Monday and Tuesday. "The way I look at it, quarterbacks should be early," Shurmur said. "He's working to be in a position to play. There is a lot to learn in order to prepare to play in the NFL." Lauletta said that he immediately spoke with Shurmur after his arrest. "I know he was disappointed and I know I can't put myself in that situation again," Lauletta said. "I have to deal with the consequences." In other quarterback news, Shurmur also said that Eli Manning will remain the starter for Monday night's game against the San Francisco 49ers. "He's starting Monday with the idea that he is going to get us on a run here and win some games," said Shurmur, whose team is 1-7. Veteran Alex Tanney has been listed as the No. 2 quarterback on the Giants' depth chart all season. There was a possibility Lauletta would be given the opportunity to start a few games once the Giants were out of playoff contention. Now, Lauletta's chances to start have greatly diminished with this arrest. "The first thing I thought of was that I was leaving (home) later that I should have," Lauletta said. "It's my fault. I will take this as a lesson. I can't put myself in these situations moving forward. I don't know if I'm worried about (not getting the chance to play). I can't afford to worry about it. I just have to do everything I can to prove that I can play. I'm going to give it everything I have, keep my head down and keep moving forward." Lauletta said that he did not want to "talk about the details of the incident," especially after he was asked about going through the same traffic pattern illegally two days in a row. "I was wrong," Lauletta said. "I know that. It's a horrible feeling. I stand with what happened. I made a decision I'll regret for the rest of my life. I have to show up early every day from now on. Hopefully, this all will be part of my past and I'll never allow what happened to happen ever again. I woke up late and put myself in that situation." Lauletta said that he has spoken with Manning about the incident. "Eli has always been supportive of me," Lauletta said. "He's there for me. Right now, my goal, my main focus is to help Eli."